December 1, 2016 — NO MATTER HOW YOU CELEBRATE THE HOLIDAYS, REMEMBER THAT CHARITY IS A REAL ASPECT OF ALL FULFILLED DREAMS! Bingo is one of, if not the oldest forms of charitable fund-raising. And December is a charitable time of year. Just look around. Everyone wants you to “feel the spirit of the season”. If you already play Bingo, you know what charity means, because you support it every time you play. You may play when a certain group is hosting a certain Session, or you might be happy knowing some group is supported when you’re at a Hall or Gaming Centre — or you might not care who benefits at all. Be assured, every charitable or not-for-profit group who benefits when you play Bingo is appreciative. It means they can continue to dream about helping others — which is a big and important dream, especially these days. 2016 also gives us all a little gift. With Christmas falling on a Sunday this year, that means many of you will likely be enjoying an extra-long Holiday Break from work. Twice this month, as we also enjoy celebrating New Year’s Eve. Even if you are not a regular Bingo Player, you can still get in on the action for the Holidays, as Special Bingo events will be popping up everywhere. Mississauga’s Delta Bingo has literally doubled down on their December events, offering their popular $28,000 “12 DAYS OF CHRISTMAS” Cash Giveaway Draws (with min. $200 and up to $5,000 to win each Draw) AND their huge Friday & Saturday 7pm Event. They also continue their popular “DOLLAR DAY” Special on every Wednesday Session. CLICK HERE FOR MORE! Oshawa’s Red Barn Bingo Auditorium will offer their unique version of “12 DAYS OF CHRISTMAS”, complete with Big TV Giveaways and Bingo Gift Certificates. You can save when you play with a $2 per Strip SPECIAL every Tuesday night. Plus, there’s a FREE $1,000 Game to play in December. CLICK HERE FOR MORE! Burlington’s Bingo Connection offers their Special “12 DAYS OF CHRISTMAS” promotion with multiple Draws at select Holiday Sessions. And as always, you can save with $1 Books on four select weekly Sessions and enjoy electronic personal Bingo Verifier “TED” Specials. CLICK HERE FOR MORE! November 1, 2016 — WE REMEMBER ON NOVEMBER 11th (AND EVERY DAY)! November may not have any stat holiday, but it does have one of the most important days in the year — REMEMBRANCE DAY! Through each of our family histories, it is very probable that we have all had a family member serve in the military. Let it be said, we have always appreciated this effort, commitment and sacrifices of soldiers, seamen, airmen, medical personnel, peace keepers and support groups (including youth and training personnel) who work hard to keep us safe and to represent Canada in the highest light. We also hope you will look closer at some of the charitable and not-for-profit groups who raise funds through Bingo, including youth-oriented military training groups. 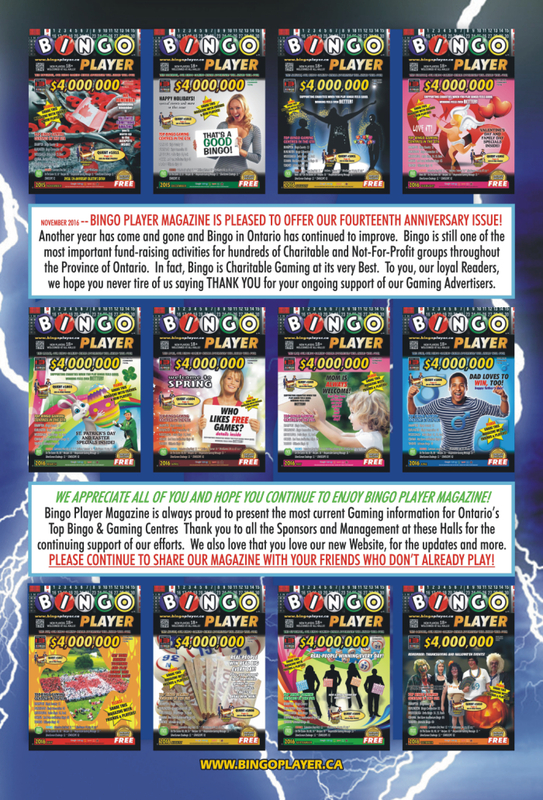 BINGO PLAYER MAGAZINE is also happy to celebrate our 14th Anniversary with our November ’16 issue. While the troubled waters the Bingo industry in Ontario has experienced in recent years have calmed a little, we are proud to continue to do what we do best — talk about and share great Bingo and Gaming opportunities for Players and new Players. Our website also continues to spread the word and attract visitors from Ontario and around the world. We are very grateful to have the undeniable support of the Sponsors and Charitable Groups in those Halls that value such feedback from such amazing people. Mississauga’s Delta Bingo continues their popular “DOLLAR DAY” Special on every Wednesday Session. There’s also a great opportunity to win more on Tuesday, November 29th, when Delta Mississauga will complete their “ALL WINNERS” PROMOTION with two special games where you can win an extra $5,000 or $10,000. This promotion begins on November 1st and runs until the final events on the 29th. CLICK HERE FOR MORE! Oshawa’s Red Barn Bingo Auditorium will offer ways to save with a $2 per Strip SPECIAL every Tuesday night. Plus, there’s a FREE $1,000 Game to play in November. The Red Barn also offers Players the chance to play a hot, new Game, called “Catch The Fireball” — a Progressive-style Game, with a Jackpot that can grow high. CLICK HERE FOR MORE! Burlington’s Bingo Connection offers ways to save with $1 Books on four select weekly Sessions. If you like using an electronic personal Bingo Verifier, the Bingo Connection has two excellent “TED” Specials. CLICK HERE FOR MORE! October 1, 2016 — FALL INTO SOMETHING GOOD THIS OCTOBER! ALSO CHECK OUT SPECIAL THANKSGIVING AND HALLOWE’EN EVENTS! Two great reasons to get out and play BINGO! Of course, Thanksgiving is the day we all get together to celebrate the harvest and each other — and the many charitable or not-for-profit groups who raise funds through Bingo are always thankful for your giving. We also have Hallowe’en at month’s end and we’re sure you can scare up something fun if you visit a Bingo Hall or Gaming Centre on the 31st. You’re sure to have a boo-tiful time! Mississauga’s Delta Bingo has lots of specials for October, including their $34,000 “TOURNAMENT OF CHAMPIONS”, which runs October 1st to the 29th, with the final big game playing on the 29th (following the 10pm Session). They will be offering an EXTRA BINGO SESSION on Thanksgiving Monday, the 10th. This bonus Session will also include FREE FOOD & BEVERAGES (while supplies last). Plus, they will continues their popular “DOLLAR DAY” Special, now on every Wednesday Session. There’s also a great opportunity to win more on Monday, the 31st, when Delta Mississauga will complete their “ALL WINNERS” PROMOTION with two special games where you can win an extra $5,000 or $10,000. This promotion begins on October 1st and runs until the final events on the 31st. CLICK HERE FOR MORE! Oshawa’s Red Barn Bingo Auditorium will offer every Player attending a FREE DABBER at three Sessions on Thanksgiving Monday (the 10th) and on Hallowe’en (the 31st). You can also dress up in your favourite Hallowe’en costume and join their HALLOWE’EN COSTUME CONTEST for chances to win RB GIFT CERTIFICATES at three select Session. They also continue to offer ways to save with a $2 per Strip SPECIAL every Tuesday night. Plus, there’s a FREE $1,000 Game to play in October. The Red Barn also offers Players the chance to play a hot, new Game, called “Catch The Fireball” — a Progressive-style Game, with a Jackpot that can grow high. CLICK HERE FOR MORE! Burlington’s Bingo Connection offers everyone in the area the chance to visit and enjoy a CUSTOMER APPRECIATION BBQ from Noon – 7pm on Saturday, October 1st. Plus, Players can save with $1 Books on four select weekly Sessions. If you like using an electronic personal Bingo Verifier, the Bingo Connection has two excellent “TED” Specials. CLICK HERE FOR MORE! We look forward to seeing you at your favourite Bingo Gaming Centre whenever you can make it. September 1, 2016 — WORK IS DONE. TIME TO PLAY. HAVE A “BINGO” LABOUR DAY! That’s right, people! Monday, September 5th is a big day for those who work hard. Okay, we know some of you are “hardly working” (lol), but we hope all of you will havae a few hours to visit your favourite, local Bingo Gaming Centre this Labour Day Weekend. Mississauga’s Delta Bingo will be offering an EXTRA BINGO SESSION on Monday, the 5th. This bonus Session will also include FREE FOOD & BEVERAGES (while supplies last). Plus, they will continues their popular “DOLLAR DAY” Special, now on every Wednesday Session. There’s also a great opportunity to win more on Saturday, the 17th, when Delta Mississauga will offer a “DOUBLE ACTION” SPECIAL BONUS with FOUR “MUST-GO” GAMES @ $1,000 EACH. CLICK HERE FOR MORE! Oshawa’s Red Barn Bingo Auditoriumwill offer chances to win RB GIFT CERTIFICATES at three select Session on Monday, the 5th. They also continue to offer ways to save with a $2 per Strip SPECIAL every Tuesday night. Plus, there’s a FREE $1,000 Game to play in September. The Red Barn also offers Players the chance to play a hot, new Game, called “Catch The Fireball” — a Progressive-style Game, with a Jackpot that can grow high. CLICK HERE FOR MORE! Burlington’s Bingo Connection also offers Players the chance to get $1 Books on four select weekly Sessions. If you like using an electronic personal Bingo Verifier, the Bingo Connection has two excellent “TED” Specials. CLICK HERE FOR MORE! Mississauga’s Delta Bingo continues their popular “DOLLAR DAY” Special, now on every Wednesday Session. Plus, they are holding their famous, “All Winners Promotion” from the 1st to the 30th — with Special Games on the 30th which will offer chances to win $5,000 or $10,000 more. CLICK HERE FOR MORE! Oshawa’s Red Barn Bingo Auditorium also offers ways to save with a $2 per Strip Special every Tuesday night. Plus, there’s a FREE $1,000 Game to play in August. The Red Barn will also be offering a hot, new Game in August called “Catch The Fireball” — a Progressive-style Game, with a Jackpot that can grow high. CLICK HERE FOR MORE! 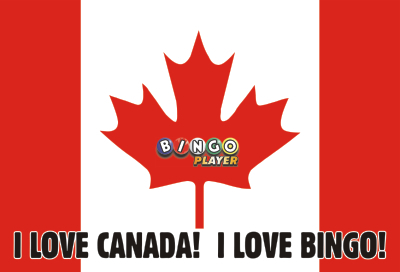 July 1, 2016 — HAPPY CANADA DAY, BINGO PLAYERS! SHOW YOUR PRIDE AND SHOW YOUR SUPPORT OF CHARITABLE GAMING TODAY (OR ANY DAY)! For Canadians, July 1st is the most important day of the year. It’s the day we celebrate being Canadian. Being Canadian means a lot of different things, but one thing it means is that we like to help others. THAT is what Charitable Gaming is all about, too! 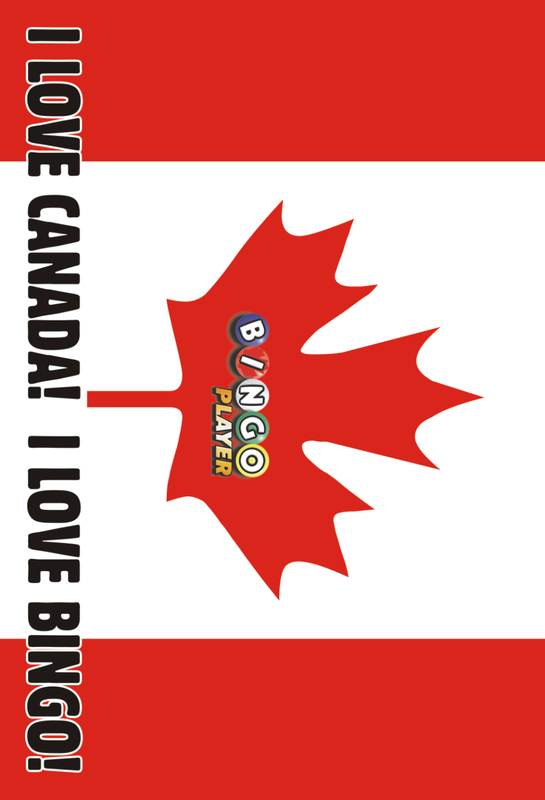 Why not click the “Flag” icon below and print off a special “Bingo Player” Canada Flag to show your love of our country and of YOUR FAVOURITE GAMES! Get a FREE DABBER at any Canada Day Bingo Session (Friday, July 1st only) at Oshawa’s Red Barn Bingo Auditorium. Plus, there’s a free $1,000 Game to play in July. If you are looking for ways to save on your favourite game, check out “DOLLAR DAY” Sessions, now on every Wednesday Session at Mississauga’s Delta Bingo. Plus, they offer up to $27,000 in prizes every Friday and Saturday 7pm Session. You can also get $1 Books on four select weekly Sessions at Burlington’s Bingo Connection. If you like using an electronic personal Bingo Verifier, the Bingo Connection has two excellent “TED” Specials. CLICK HERE FOR MORE. Get a FREE DABBER at any Father’s Day Bingo Session (Sunday, June 19th only) at Burlington’s Bingo Connection or at Oshawa’s Red Barn Bingo Auditorium. If you are looking for ways to save on your favourite game, check out “DOLLAR DAY” Sessions, now on every Wednesday Session at Mississauga’s Delta Bingo. Or, why not PLAY FOR FREE? Wednesday, June 22nd — $1,000 FREE FACE GAMES only at the Red Barn. Get Free Face Card at any Session from June 1 – 14. Remember to take those cards with you to the Free Games event on the 22nd. CLICK HERE FOR MORE. May 1, 2016 — DID YOU KNOW? MANY YOUTH-ORIENTED ACTIVITIES AND PROGRAMS ARE PARTLY-FUNDED BY BINGO PROCEEDS. THAT’S A REAL-TIME IMPACT WHEN YOU PLAY BINGO! Every Bingo Session has a different Sponsor, so you can pick the groups you want to support in a way that you might win, too! Or, just drop in and play a Session and know the group that’s benefiting appreciates the support. One of the biggest events in the whole province of Ontario this month is the chance to win a brand new 2016 Chevy Cruze, only at Mississauga’s Delta Bingo . The final draw is in June, but you’ll have many chances to get in on the action with draws and ballot giveaways throughout May and until the Final Draw event. If you didn’t know, the whole Team at Delta Bingo Mississauga is always driven to serve you! And — don’t forget there are SPECIAL EVENTS this May: SUNDAY, MAY 8th IS MOTHER’S DAY!! Get your FREE DABBER at Burlington’s Bingo Connection and at Oshawa’s Red Barn Bingo Auditorium. MONDAY, MAY 23rd is the Holiday celebrating the Queens Victoria. You’ll find an extra Session at 10:00 am at Delta Mississauga, complete with FREE BBQ & DRINK (while supplies last)! April 1, 2016 — SPRING INTO YOUR LOCAL ONTARIO BINGO GAMING CENTRE FOR GREAT CHANCES TO WIN BIG MONEY! Sure, the weather specialists just had to let us know about a Polar Vortex and a little more snow coming to Ontario. After that, it looks like smooth sailing into Spring. We look forward to seeing you at your favourite Bingo Gaming Centre whenever you can make it. We also know that your local Charitable and Not-For-Profit Groups who raise important funds through Bingo also look forward to seeing you, too! And don’t forget the FREE GAMES at Burlington’s Bingo Connection, Mississauga’s Delta Bingo and at Oshawa’s Red Barn Bingo Auditorium. If you haven’t played Bingo, or haven’t been in a while, please take advantage of these FREE GAME opportunities and visit, today! March 1, 2016 — WINTER MAY BE TRYING TO MAKE A COMEBACK, BUT SPRING IS JUST AROUND THE CORNER! There are plenty of chances to win big money playing Bingo (big chances every day, in fact), but there are even more ways to win with St. Patrick’s Day and Easter both falling in March. You can also get free seasonal Bingo Dabbers at Oshawa’s Red Barn Auditorium Bingo. We also hope that everyone in the Mississauga area will join the amazing Team at Delta Bingo Mississauga for their Anniversary Celebrations which begin with live entertainment on Friday, March 4th and specials all day on Saturday, March 5th. And don’t forget the FREE GAMES at Burlington’s Bingo Connection. They’re offering them again in March because Players love this promotion. 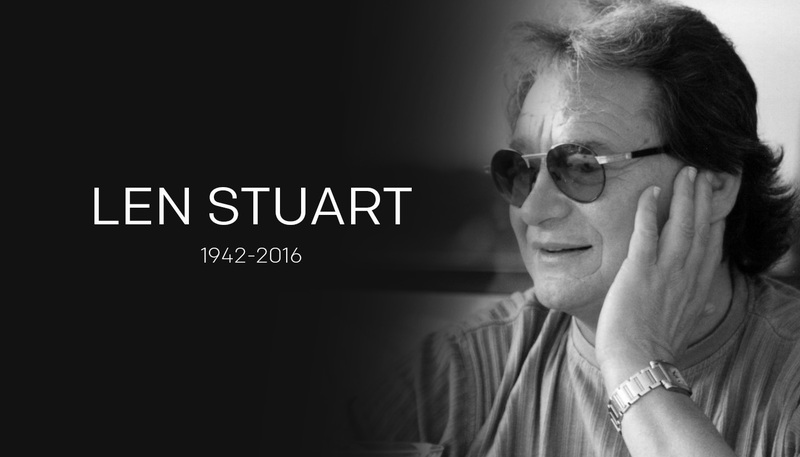 February 21, 2016 — A PASSING OF AN INDUSTRY GIANT… It was just announced on The Second City’s website that Mr. Len Stuart has sadly passed away. Mr. Stuart has long been a part of the Bingo industry in Ontario, Canada and around the world. His involvement with Bingo Halls, like the Boardwalk Entertainment Group and the Bingo Country chain (which, in the early 2000’s, had over 40 locations) is unequaled and unparalleled. He was also involved as an Owner of Bazaar & Novelty at several points in his career. His brothers also work in the Bingo and Gaming industry. Mr. Stuart was also involved with The Second City, including the SCTV Network. 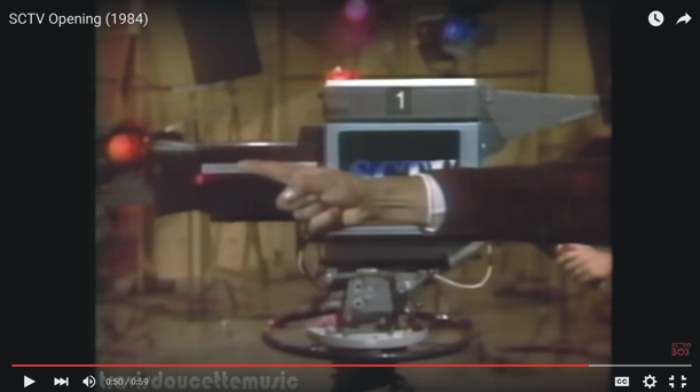 If you’ve ever seen the opening of the show, it’s Len’s hand that signals to go to air, just before the opening credits finish. These are just a few of Len’s accomplishments, and there are so many more. Always a busy man, it was a pleasure to meet him in 2002, even if only for a few moments. A few years later, we met again at a Second City Alumni Week event, which featured some of the SCTV cast re-uniting on stage. Andrew Alexander, CEO/Executive Producer of the Second City wrote, “I am very sad to announce the passing of my close friend, business partner and co-owner of The Second City, Len Stuart. He died peacefully while surrounded by his family and friends after a short illness. My thoughts and prayers are with his family. For more information, please visit The Second City’s website using THIS LINK. February 1, 2016 — IT’S A GREAT TIME TO WARM UP TO BINGO! It’s still trying to be winter in most of Ontario and, sometimes, in the Greater Toronto Area (GTA), it’s been downright balmy. This also means it’s easier to get out and about, especially to play your favourite Games. Thank you for playing Bingo when you can. And even if the Groundhog decides there’s more winter ahead, in a few weeks it will be a big weekend in Ontario with VALENTINE’S DAY on Sunday, the 14th — and FAMILY DAY on Monday, the 15th. For many of you, it will mean VALENTINE’S DAY SPECIALS and an extra chance to play on the Monday. Finally, we also wanted to let you all know about a very SPECIAL OPPORTUNITY for Mississauga and area Players. DELTA BINGO MISSISSAUGA is offering a special “Tournament Of Champions” promotion through February. CLICK HERE for more details! DID YOU KNOW? When you scroll down a page on our website, a special tool appears at the bottom right corner of the page – with an ARROW POINTING UP. Click it and you will be taken to the top of whatever page you are viewing. We work hard to make our website more effective and easier to navigate on whatever device you are using. January 5, 2016 — CHECK OUT DELTA MISSISSAUGA’S NEW LOGO!! We always like to share exciting news — and we’re thrilled to share a new logo for Delta Mississauga with you. In the Mississauga area, you really can’t find a better Bingo experience. Players really appreciate the incredible Staff and love the many amazing Sponsors. But, that’s old news — everyone knows, Mississauga residents care about each other. Congratulations to Delta Bingo & Gaming for their bold new look. It’s a WINNER! Click the new Delta Bingo & Gaming LOGO to check out Delta Mississauga’s current information. DID YOU KNOW? At the bottom of every Bingo Gaming Centre page on our site, you’ll find LINKS to full lists of Sponsors (the Charitable or Not-For Profit Groups) who benefit when you PLAY BINGO! These Groups further strengthen their communities by using proceeds to help people directly — through their actions and passions. You will clearly see that Bingo provides important funding opportunities to all kinds of different Groups, doing all kinds of invaluable work. Some of the links on new web pages may also lead to further websites and more information on specific Groups. We’ve met many Players who will play certain Bingo Sessions because it’s a favourite Group’s time to raise important funds. Plus, there’s a chance they might win something, too! If you have a sense of volunteerism or compassion for a particular Group, please visit or call the local Bingo Gaming Centre and get more information on how you can get involved. January 1, 2016 — IT’S A NEW YEAR AND WINTER’S HERE (OR IS COMING SOON) WHICH MAKES IT THE PERFECT TIME TO WARM UP TO BINGO AND THE GREAT OPPORTUNITIES TO WIN! We hope that you and yours have a safe and exciting 2016. We very much appreciate your support of our printed and online magazines. Thank you for playing Bingo when you can.